OH MY GOD! SNOW! AHHHHHHHHHHHH! Okay so people aren't panicking too much yet but I have heard people are mentioning "snowmageddon" simply because the forecast calls for 8 inches of snow. Really? This is winter. Put on a scarf and enjoy the ride. 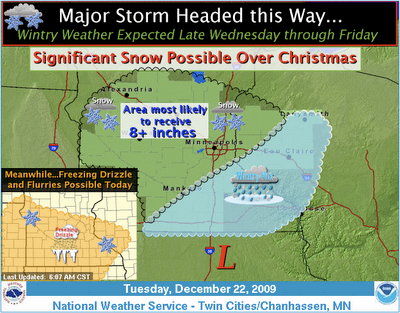 Here's the latest graphical forecast for the Twin Cities area. WCCO's current Twin Cities forecast predicts about 4" tonight, 5-6" tomorrow, 4-5" tomorrow night, and 3-4" on Friday... that's 15-18". And, hey, weather that you can't help noticing is inherently exciting. After a San Francisco upbringing where it snowed about twice, we rarely got thunderstorms (though we did get plenty of heavy rains, in between droughts), and typical year-long temperature extremes were only about 40 degrees apart, I find "real" weather seriously interesting, even after 27 years in the Midwest. Merry snowmas!